As part of its continued and long-term commitment to supporting training initiatives around the world, the International 420 Class Association has recognized its first I420 Sailing Academy. 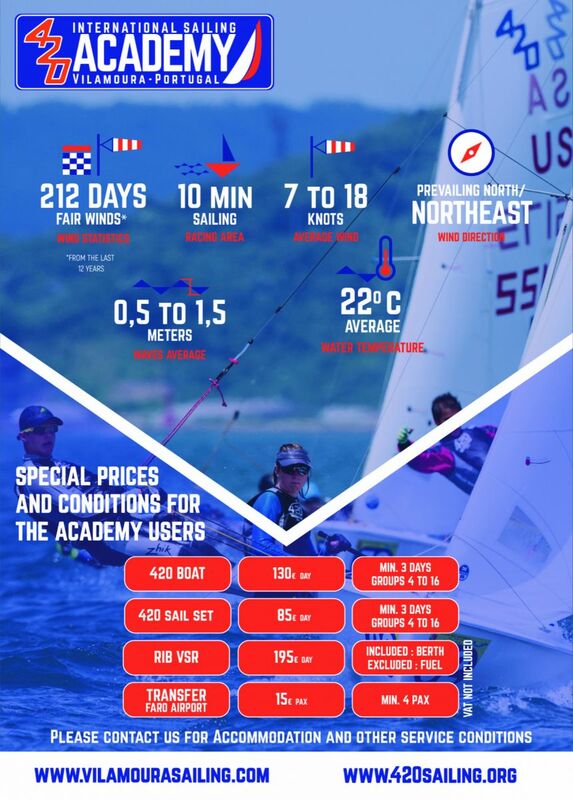 The goal of the I420 Sailing Academy is to provide a fully equipped training environment where teams and coaches from around the world can participate in training camps and clinics in a specialized and centralized location. The first I420 Sailing Academy is at Vilamoura Sailing Centre, on Portugal’s southern coast and within easy access to Faro airport. Vilamoura Sailing Centre offers classroom, gym and restaurant facilities, as well as ample secure parking and boat storage, on site chandlery, free wi-fi, games room, and a range of onsite and nearby accommodation. “The I420 Sailing Academy Vilamoura is an excellent starting point for novice teams to develop their skills in the 420, whilst equally providing a world-class training base for experienced teams. The 420 Class Association will run both sailor and coach clinics at the I420 Sailing Academy during the year. Through a mix of on-water sessions, lectures, exercises and presentations, the High Level Coaches Clinic will encompass elements of leadership, coaching, physiology, lifestyle and training culture, as well as looking at the responsibility role coaches and mentors play in developing better people, not just better sailors. A Sailors Clinic is also scheduled for 2018, with final dates to be announced. The partnership with Vilamoura Sailing Centre marks the first of a series of I420 Sailing Academies which will be established in key locations to best support and collaborate with the worldwide 420 fleet. The 420 Class is also committed to recognizing I420 Sailing Academies in other hub venues, focusing firstly on Europe, Asia, North and South America. The I420 Sailing Academy programme is about building an enhanced infrastructure for the future, for developing and developed 420 nations that is accessible to all. Facilities available for 420 National Class Associations, Teams, to use at preferential rates.